Giant Cannas to create stunning fiery displays of colour. Cannas are one of those exotic beauties that do so much for the bright summer garden. With their lush, tropical foliage and showy, exotic blooms, they set borders and beds alive with fiery colour. Hugely architectural, the yellow, orange and red flowers will erupt in beds and borders through the summer, adding height and impact. Perfect for growing in large pots, at the back of borders, in sunny, well drained spot. Over-winter the tubers in a frost-free area for planting again the following year. Supplied as a pack of 3 HUGE jumbo size rhizome tubers, ready for immediate planting. Easier to grow than you may think, cannas are one of those exotic beauties that swiftly helps to create a bright, zingy summer garden. With large, banana shaped leaves, their fiery hot colour combinations of yellow, orange and red will erupt throughout your beds and borders, adding great height and impact too. Each pack is a mix of 3 named varieties with a mix of the green-leaved and lovely purple-leaved types, selected from taller flowering cultivars, so all will flower at 1m or more. Renowned for their tall flower spikes and architectural leaves, grow them in large pots, or at the back of borders, in hot, sunny spots, in well-drained areas. Feed well when in growth - they will not start growing much until May, they grow away quickly as the summer warms. They will over-winter if they do not get too wet and will benefit from a mulch - or the tubers can be dug up and stored in a cool, frost-free place over the winter for use again next year. A stunning combination of cream, pink and yellow, the blooms are truly outstanding. This Purple leaved canna will add plenty of colour to your garden borders, beds or containers. The butter-yellow flowers have striking orange speckled throats and sit above bright green leaves to add a citrus sparkle to your displays. A more subtle combination of green Leaves and dark orange/red flowers, this is a spectacular canna, providing contrast to the other varieties. All will grow to 1m plus and flower from July to October. Hold off cutting off old flowers - new flowering shoots come up within the dead flower and, a month or so later, will produce more flowers. Cannas perform best in semi or full shade, so use these striking plants to transform darker, drier parts of the garden. Purple and striped varieties will fade in the sun to provide shade. Water freely in dry spells. Apply a general-purpose liquid feed in midsummer. Little pruning or training is needed, just stake clumps in exposed positions. When a flower spike has no more buds, prune it down to the next side shoot where a secondary flower spike should develop. 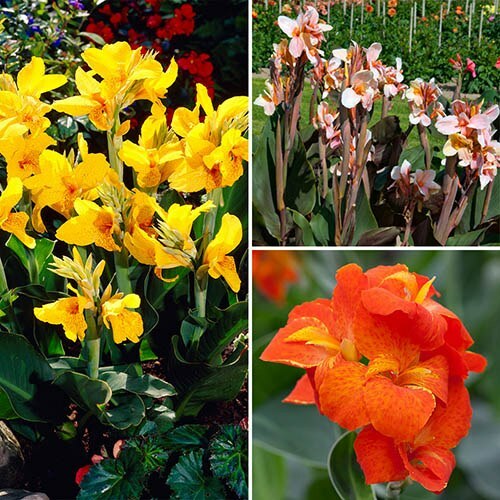 If temperatures are maintained above 10°C (50°F) cannas will remain in growth all winter and flower occasionally. Lift the plants in autumn after the foliage has been frosted. Break large clumps into two or three, and pot the pieces into 10in (or so) pots. You can then overwinter them in any frost-free shed or greenhouse, keeping them just slightly moist. When the plants start to push up their red shoots in spring, bring them into a light place, water well and protect them from late frosts. By June, growth will be well under way and they can be planted out once more.